The Andes are the longest mountain range in the world, stretching 4,500 miles long and spanning seven South American countries: Venezuela, Columbia, Ecuador, Peru, Bolivia, Chile, and Argentina. Andean ecosystems include peatlands, grasslands, shrublands, salt flats, forests, and alpine regions. 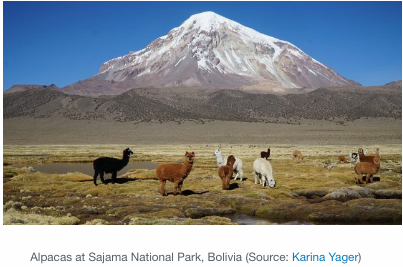 Mountain peatlands, or bofedales, play a particularly central role in the rearing of llamas and alpacas, which provide wool and meat to Andean, pastoral communities. In order to remain productive and green, bofedales require continuous water supply from precipitation, groundwater, and glacial outflow. Without adequate water flow, bofedales are likely to dry up. Climate change and poor irrigation exacerbate the drying of bofedales. 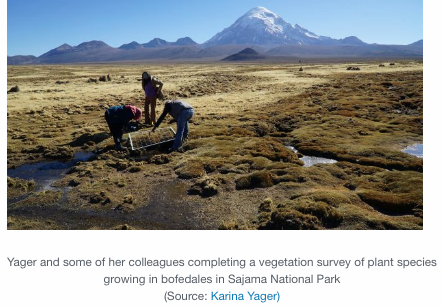 A recently published research article in Springer Nature analyzes bofedal changes due to decreased water availability in Sajama National Park (PNS) in Bolivia. Karina Yager, NASA researcher and Stony Brook University professor in the School of Marine and Atmospheric Science, leads the scientific investigation. Using satellite image analysis, vegetation studies, and traditional ecological knowledge, Yager and fifteen of her colleagues, from institutions in the U.S. and South America, study land cover changes over a 30-year timeframe and identify communal perspectives on drying bofedales. PNS contains five pasture areas, where Andean communities reside. The pasture areas include:Sajama, Lagunas, Caripe, Papelpampa, and Manasaya. Members from all five communities participated in focus group sessions to share information regarding bofedal condition, climatology, and potential irrigation actions. Through field work and data collection, the researchers find that three communities within PNS—Sajama, Lagunas, and Manasaya—show significant loss of healthy bofedales. These land changes will likely result in decreases to animal health and communal livelihoods. In addition, completely dried bofedales are difficult to restore and likely take generations to recover. Yager states to GlacierHub: “These are peatland systems that are relatively slow growing and have developed in many cases over several millennia. Some of the systems in Sajama are over four thousand years old, and unfortunately some have become completely desiccated within the last five to ten years. On the other hand, increases in healthy bofedal land cover is observed in the two other, irrigated PNS regions of Caripe and Papelpampa. This finding signals that proper irrigation management and communal-based pasture management are critical to the conservation of bofedales.